by Berridge, Richard, Chanson, Janice, Cox, Neil A., Hoffmann, Michael, Ramani, Pavithra, Stuart, S. N., Young, Bruce E..
Amphibians are facing an extinction crisis, but getting to the facts has been difficult. 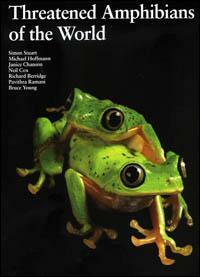 Threatened Amphibians of the World is a visual journey through the first-ever comprehensive assessment of the conservation status of the world's 6,000 known species of frogs, toads, salamanders, and caecilians. All 1,900 species known to be threatened with extinction are covered, including a description of threats to each species and an evaluation of conservation measures in place or needed. Each entry includes a photograph or illustration of the species where available, a distribution map, and detailed information on range, population and habitat and ecology. Introductory chapters present a detailed analysis of the results, complemented by a series of short essays written by many of the world's leading herpetologists. Appendices include annoted lists of lower risk species and a country-by-country listing of threatened amphibians.